Before a product is produced, we first source the finest American milled aluminum. It is important to know there is no such thing as medical grade aluminum. The quality differences in aluminum primarily are associated with tensile strength and added elements. We exclusively use special edition aluminum from our vendor that is stronger and aids in our incredibly strong and robust cutting diamonds that have been proven in our 20 years of operation. 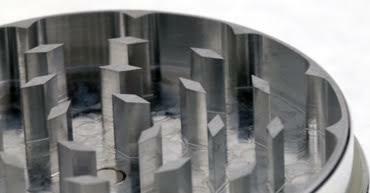 Our diamond tooth design cuts, shreds and grinds your herbs to the desired texture of your choice. Another feature which is important to our customers over the past 20 years is our centering wedges. The centering wedges are the outer points which push herbs back to the center for constant movement as our opposing bi-directional diamond teeth do their job until your texture is achieved. After your herbs falls through transition holes it is met by a medical grade T-316 Stainless Steel Screen. From here, only pollen from your herb passes through the screen which was pressed into place using a 360⁰ tapered locking press that gives a firm screen tension. Finally, the pollen that passes through the medical grade stainless steel screen arrives on your collector plate. Your Space Case pollen pick has a matching radius to the collector plate edges to ensure optimal collection of your pollen. A magnet is not just a magnet, we source the finest magnets used by industry leaders and produced under license to the highest of standards. Our Neodymium rare earth magnets are ROHS compliant for responsible environmental protection.